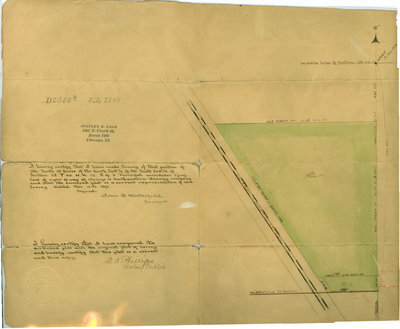 Hand drawn survey of Wilmette. Green wash color on part of the map. D2500B File 2649; [stamped] Stanley K. Gage, 105 N. Clark St., Room 709, Chicago, Ill. I hereby certify that I have compared the annexed plat with the original plat of survey and hereby certify that this plat is a correct and true copy. C. A. Phillips, Notary Public.